What are you actually doing when you listen to someone else speaking? Do you really listen to their story? While listening to someone talking our brain works in the accelerated manner, so that we actually hear many voices. The voice of the teller can be rather weak in comparison with our inner voices of disagreement and criticism, the voice of the need to respond immediately, the voice of rationalism and last but not least, a silent voice of approval. Some of them make us cut into the conversation. We always listen not only through the lens of our personal experiences and our own stories but also with the involvement of our cultural perspectives. And so the habit of cutting into conversations and talking simultaneously does not surprise any Spanish speakers from Latin America, is a “no-go” in German-speaking countries, where most people would react to such interruptions with the words “Let me tell it to the end!” and is hard to imagine in Chinese speaking groups. 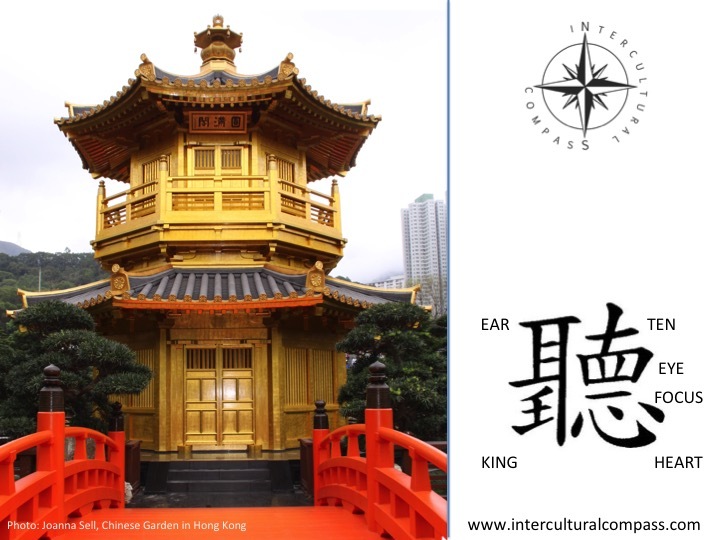 The Chinese character – TING聽 (translated as „to listen to“) captures the „layers“ of listening and explains why such interruptions hardly ever happen. In the top left – the EAR means to literally hear the spoken words and the intonation. In the top right there are the number 10 and EYES indicates maintaining “10 eyes” contact to observe facial expressions and focus on the non-verbal signals. The horizontal sign below (which symbolizes number one) stands for UNDIVIDED ATTENTION and focusing on the message the teller wishes to communicate. The symbol below stands for the HEART – to understand the feelings of the speaker. To the left there is a symbol of the KING, indicating that listening is a combination of the senses and phenomena used to create the word TING. I came across the translation of this sign as the mind as well. Deep listening requires practicing and is one of the greatest presents we can give one another. Undivided attention is a sign of respect and caring about another person. <b>Persons you lead want to feel that you care about them, that their challenges, their moments of weaknesses and their successful actions matter. They wish to know that their voice is heard. Bearing in mind the layers of listening, as a leader you need to focus not only on the person, who shares a story with you but also on your self-awareness. Self-awareness is the ability to recognize your emotions and observe how they affect your performance and interactions with other persons. Knowing about attentive listening as one of the required leadership skills is hence just the first step to improving it. It requires emotional intelligence, which guarantees that the application of attentive listening would lead to positive results. No deep listening can take place when the self-awareness is on stand-by. In order to listen to someone, you need to activate more senses than just hearing. Listening to other people with your ears, eyes, your mind and your heart is the key to the appreciative leadership.